The AMP Research PowerStep™ has been tested and proven in long-term, real-world, driving conditions performing flawlessly in snow, ice, dust, mud and dirt. The lightweight, yet rock-solid running board and rugged die-cast linkage components are crafted in the USA of aircraft-quality aluminum, black-anodized and Teflon® coated for maximum corrosion protection. Precision, stainless-steel hinge points and bearings ensure trouble-free action. And the heavy-duty electric motor is designed and tested to provide reliable, maintenance-free operation for decades. IF IT DOESN’T SAY “AMP RESEARCH,” IT ISN’T ONE. AMP Research invented the power-deploying running board, so don’t be fooled – There is only one PowerStep™ and it has the AMP Research name on it. Which is why AMP Research created the PowerStep™, the automatic, electric-powered running board that instantly extends when you open your door, and then tucks itself back safely under the chassis when the doors close. 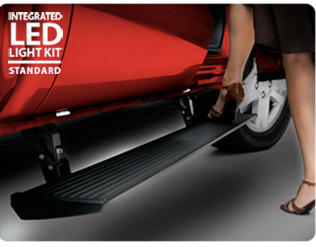 When retracted, the PowerStep™ is essentially hidden underneath your vehicle for improved ground clearance, aerodynamics and appearance. And when extended, it provides a sure, solid, high-traction leg up for you and all your passengers, large or small. Stop climbing. And start stepping up, with the AMP Research PowerStep™.